The Department of Foreign Affairs (DFA) has reportedly pledge to shoulder the expenses to bring back the remains of the newlywed couple Leomer and Erika Joyce Lagradilla home. The details of the incident are not yet clear, according to Leomer's sister Mhapolle Lagradilla. However, a Facebook user Raymond Adofina announced the positive meeting of the families and the DFA. "At around 9:52 pm, @mhapz lagradilla, sister of Leomer,informed us that they had a positive meeting with the DFA today. Accordingly, DFA will shoulder the expenses in sending Eka and Leomer's remains back home. Hopefully, this good news will be confirmed tomorrow by Leomer's father after his meeting with DFA Usec," Adofina wrote. 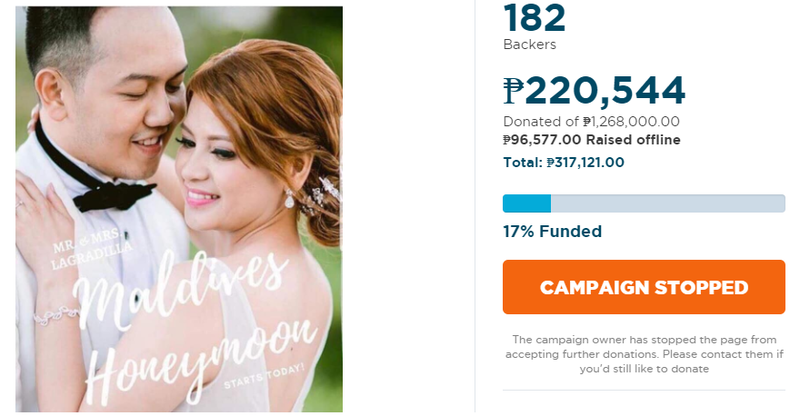 Prior to the meeting with DFA officials, the family and friends are raising funds online to bring back the couple's body to the Philippines that would cost about P1.2 million. Following to the news, Adofina the creator of funding page announced that they had stopped incoming donations from the page. "In connection to this, we would like to let you know that we have decided to stop accepting donations as we believe that due to the mentioned optimistic progress of this case, we no longer serve the purpose of creating a fundraising campaign anymore. We can now have something to hold onto knowing that there's a hopeful promise from our govt's end. We are beyond grateful for your donations for our beloved friends, Leomer and Eka," He added. The couple are both breadwinners of their families and had to undertake in a long distance relationship. They are both nurses by profession and both are in relationship for 11 years before they decided to tie the knot.